Chelsea and Man Utd fans will not be impressed with Casemiro after he insisted both Paul Pogba and Eden Hazard would be welcome at Real Madrid. As noted by Marca, both players have been linked with a move to the Bernabeu this summer, as Real Madrid seemingly have ambitious plans to rebuild the squad. 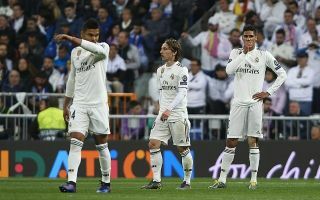 It comes after a disappointing campaign in which they crashed out of the Champions League and Copa del Rey last month, while they sit 13 points adrift of La Liga leaders Barcelona with just seven games remaining. Zinedine Zidane’s return last month was arguably the first step in making major changes ahead of next season, and Casemiro has opened the doors to both Pogba and Hazard joining them this summer as he has insisted that world-class players are always welcome at the club. “I always say that Madrid must have the best players, as this is the best club in the world,” he said on Pogba and Hazard, as noted by ESPN. “But it is not for me to say which players should be signed. “The president [Florentino Perez] and other people are very prepared for that. But they are both very good players, and very good players are always welcome at Real Madrid. “A world class player at his [Pogba] level can play in any team. If he comes to Madrid he would be welcomed very well — we know he is a great player. Given he has publicly welcomed the idea of Pogba and Hazard joining, it could be argued that he hasn’t shown a huge amount of respect to United or Chelsea already. Nevertheless, it’s just the Brazilian’s opinion and he has a right to express it, but ultimately it remains to be seen if Real Madrid can sign two world-class individuals in the same window as much will surely depend on their transfer budget. Hazard would certainly help fill the void that hasn’t yet been filled since Cristiano Ronaldo left last summer, while Pogba’s quality and experience in midfield would be a welcome addition to the likes of Luka Modric and Toni Kroos, should both stay on for next season.